Wired Magazine (via @WorldCommute on Twitter) Employers finally showing bike commuters some love! Active.com - Reasons to commute and advice from a top exercise site. The basic message: if you have a bike, you can bike commute! Lighter Footstep - 12 reasons to bike commute! Cyclelicious - Tired of people saying that cyclists are getting a free ride (no pun intended) by not paying gas taxes? Well, read this: gas taxes don't come close to paying our road maintenance costs anyway! 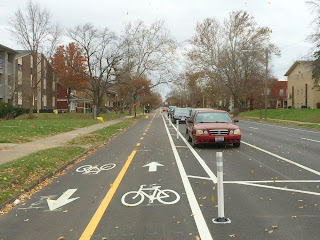 Ray George's excellent Columbus Rides Bikes website brings us a report on the Summit/3rd Street bike lanes, the first one of its kind in the State of Ohio. This lane, which is a two-way bike lane going from Hudson Street south to 11th Avenue in the University District and then one way the rest of the way downtown (including a lane across the I-670 overpass) is separated by concrete barriers and other road controlling measures. The Dispatch report that Columbus Rides Bikes shared on Facebook today is entitled "More crashes come with more bicycle traffic on dedicated lanes," and discusses the new lanes and the number of accidents that have happened there. None of these accidents/crashes has been fatal. 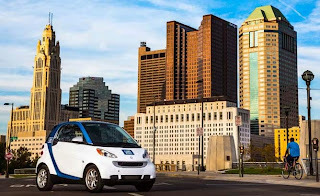 In a move that has left quite a few people stranded in Columbus, the ride-sharing company Car2Go has announced today that they're pulling out of the local market as of May 31. This has got me more than a little pissed off and very inconvenienced. There's no doubt - Car2Go improved the quality of my family's life for the past few years while they were active in town. As a one-car family where I rode my bike and took the bus most days, Car2Go filled in the gap nicely when we needed that extra set of wheels to get ourselves places. Yes, the City of Columbus has an iPhone app. And an Android App, if you're so inclined. It's actually been out for a couple of years now, and it gives locations of city services and the like. I've not mentioned the thing here on Carless Columbus in the past because, frankly, I haven't found it all that useful (and if the features I'm talking about have actually been part of the app in the past, I apologize, I just discovered them recently).